When we have guests come into town there are a few places that we always take them. Our first and favorite is probably Gruyères. 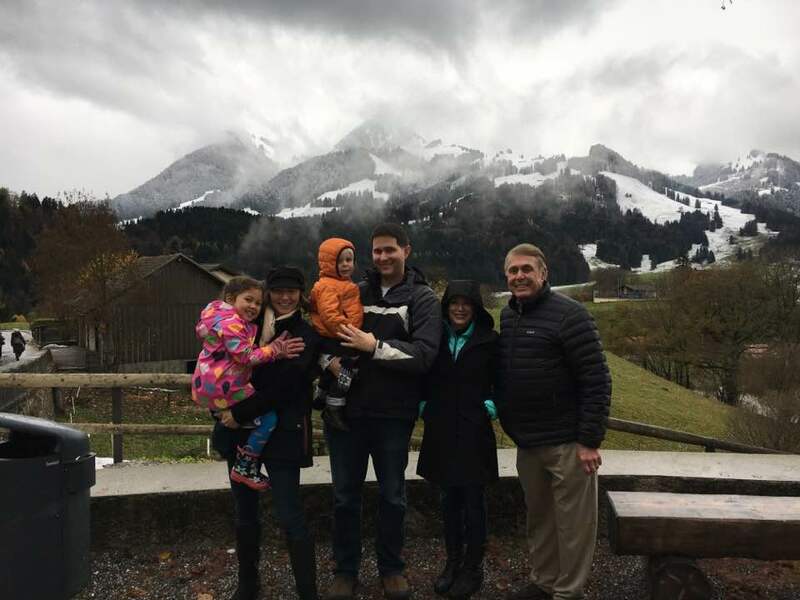 I think we have visited this town more than 15 times, but each time we find it enjoyable and have never tired of bringing our friends and family. If you come to visit us for 1 day this is probably where we will take you. 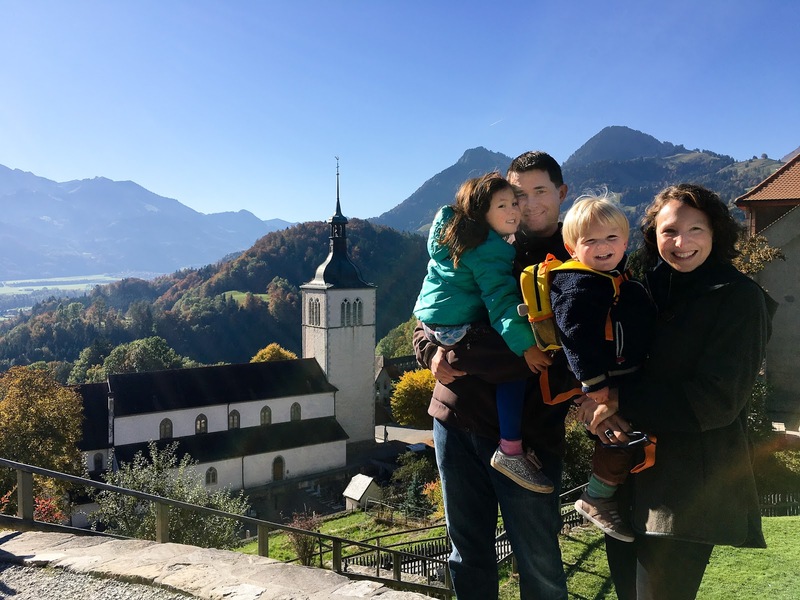 It is the perfect combination of mountain views, castle tour, a typical Swiss dish - fondue, and a tiny pedestrian only medieval town tucked in the mountains. The drive from our house is less than an hour and is very scenic as you drive along Lake Geneva with the Alps towering behind, passing through the Lavaux Vineyards (a UNESCO World Heritage Site) and then driving into the Swiss countryside. Because it is pedestrian only, it is a nice safe area for the children to explore and run around without the fear of cars. But, the town sits up on a hill and the parking is just below at the bottom, so be prepared to walk up a gravel path to reach the town. 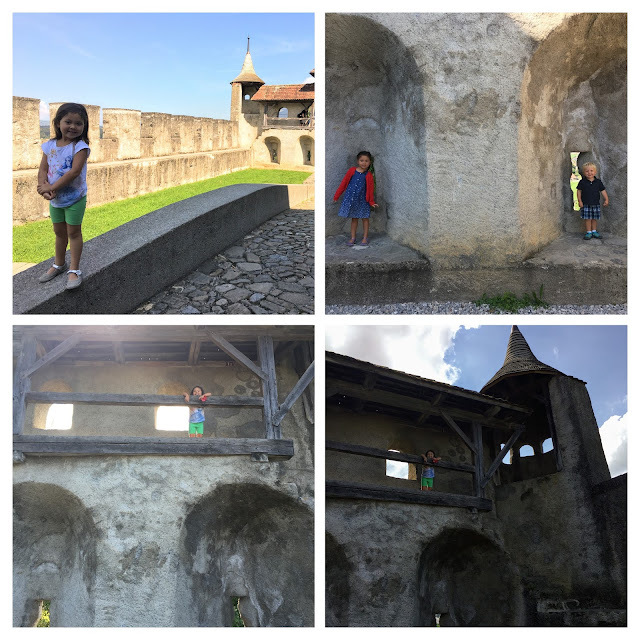 The children always love climbing up the crumbling castle stairs just inside the city walls. It is like a natural playground where they can run and climb (with some supervision). You are greeted by a large water fountain after walking into the main square and cobblestone streets. The water is "eau potable", meaning drinkable. In the Summer we have seen cyclists bike up the hill and then stop to fill their water bottles in this fountain. There is one main street that is lined with buildings on either side filled with restaurants, souvenir shops, a couple small hotels and local resident's homes. Our first visit to Gruyere - Eliana 4 months old. Large drinking fountain behind us. We enjoy leisurely walking through this main street. At the end of the street on one end is one of our favorite places to get an ice cream in the Summer and enjoy the mountains and pastures just below the town. 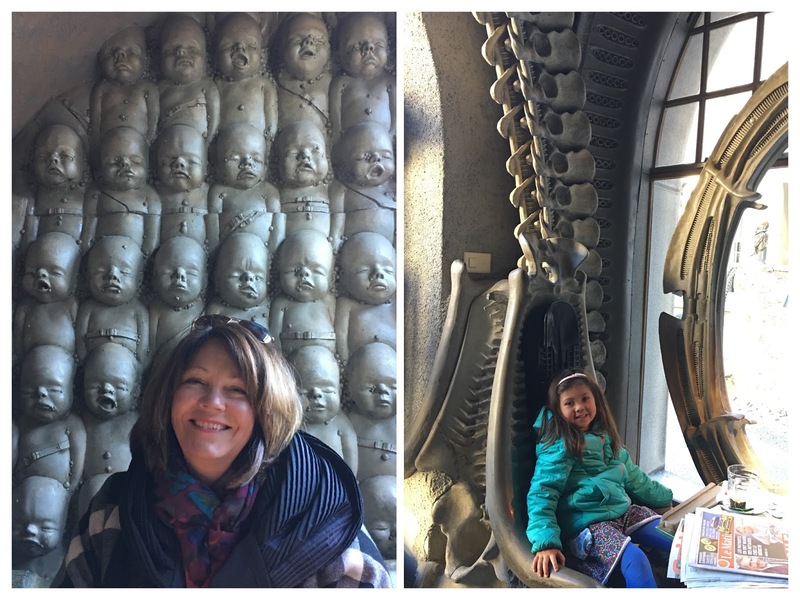 If you walk in the other direction, back on the main street, we enjoy passing the Giger Bar and Museum and looking at the very odd sculptures and architecture. We will often get to Gruyere early (to avoid traffic) and will get a coffee/hot chocolate and meringue with double creme inside the Giger Restaurant - the restaurant's interior design is so odd that it is fun to take people here just to see their reaction. After the Giger Restaurant we head up the hill toward the Castle. The castle tour itself is very nice, but even when we decide to forgo the museum tour it is nice to walk up to the castle and admire the terrace just in front of the entrance. The castle tour is child friendly as there are very few areas where they are not able to explore. A few of the rooms have roped off areas, but in general the rooms are pretty open and the children can roam around freely. When in Gruyere, you must eat fondue. The town of Gruyere is where gruyere cheese is made and shipped internationally. The fondue is fantastic and a must! We order the moitié-moitié version (which is half gruyere and half vacherin). Our favorite restaurant is Chalet de Gruyères, but be sure to make a reservation as they fill up quickly - especially in the Summer and during holidays. They have both an indoor eating area and an outdoor terrace. Our second favorite place to get fondue is Auberge de la Halle as they have a large terrace with all glass windows and wonderful views over the countryside, mountains and Gruyere church. Gruyere has several natural spots for children to run and climb, but if you are looking for an actual playground there is one of those as well. If you head down toward the church (from the main fountain take the road down the hill to the right instead of up the hill toward the castle). 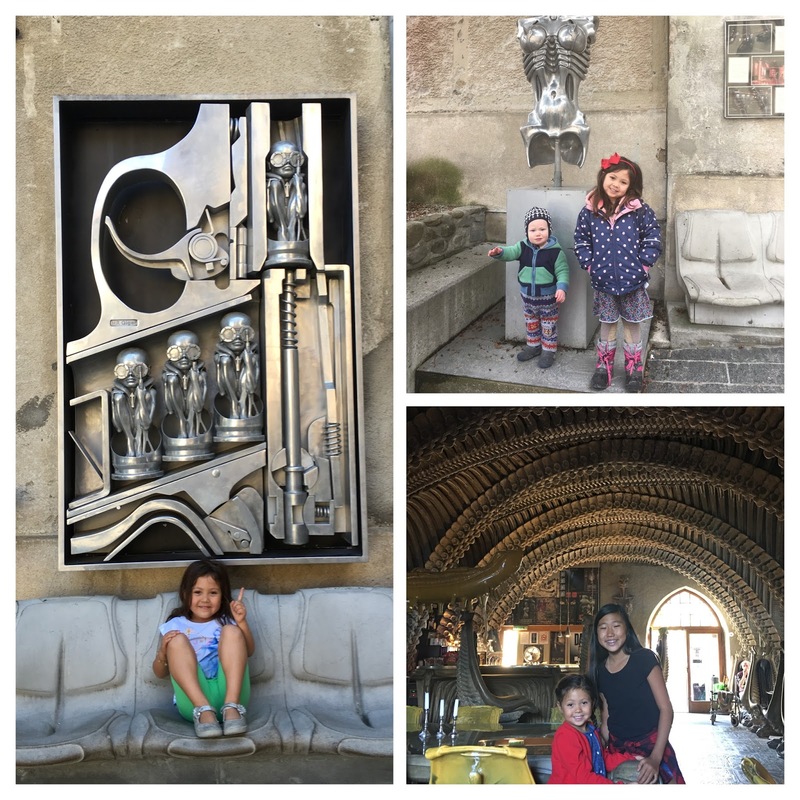 On the way admire the Gruyere church and then turn right into the playground area. The city walls enclose the playground from the hillside. The children also like to run through the covered area on these city walls. 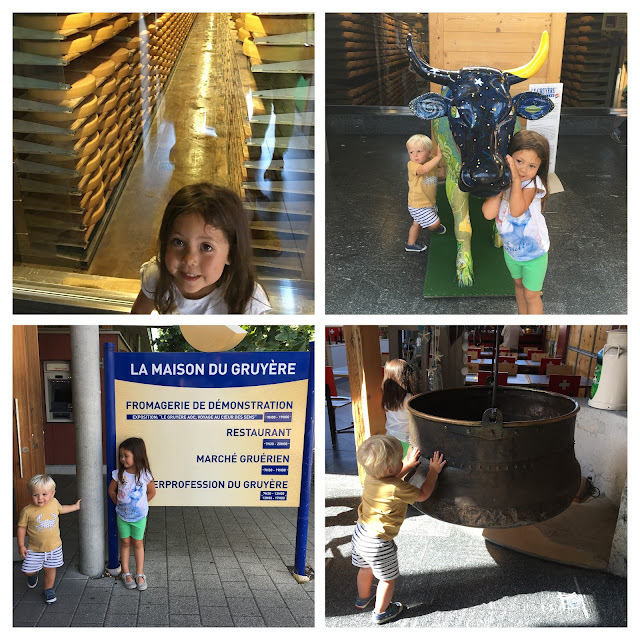 Back down in the larger town of gruyere there is a cheese factory, La Maison du Gruyère, with a restaurant and playground attached to it. The cheese factory offers tours of how they make Gruyere cheese. The restaurant has a large outdoor area to eat with the playground just outside the eating area in the grass. If you want a restaurant where children can run around while you eat this would be the place to go.